The application process varies depending on the type of course you're applying for. You may be required to provide documents to support your application. Please note that the UK Border Agency (UKVI) requires a fully certified original translation for each document you provide that is not in English or Welsh. We advise you to apply as early as possible to maximise your chances of success. You should also take into consideration the time it takes to obtain visa clearance and make any other arrangements you need to before a lengthy stay in the UK. To access the application form, please see the 'How to apply' section of the course page you are interested in. You’ll need to complete an online application form and submit it, along with scans of your original academic transcripts and certificates. You’ll also have to complete the Equal Opportunity section, which is required by UK law. Our in-country representatives can help you make your application and apply for a visa, as well as offering important advice on travel, living in the UK and studying abroad. If you’re applying for an undergraduate degree or a Higher National Diploma (HND), you can apply through the UK’s Universities and Colleges Admissions Service (UCAS). You can request a printed form from your school or nearest British Council office. There is a charge for applying through UCAS - please see the UCAS website for full details and methods of payment. Applications will be considered at any time up until the course start date, although we advise you to apply well in advance to allow plenty of time to arrange your visa, accommodation and deal with any other issues ahead of your studies in the UK. Application forms can be found on the relevant course page. 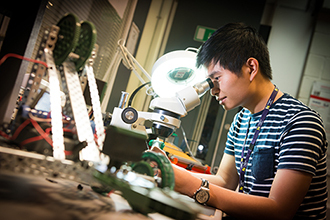 Find out more about research at Birmingham City University on our Research page. You can find a course and apply online from our course pages by selecting 'postgraduate' level and the subject area you’re interested in. If you’re interested in the GDL/CPE or LPC courses you should contact The Law Society directly. If you’re interested in PCGE courses please contact UCAS directly as you will need to apply through the UCAS Teacher Training scheme. Our International Summer School offers you the perfect opportunity to get a taste of UK Higher Education. You’ll spend three weeks gaining first-hand experience of university life in the UK and improving your spoken and written English. If you’re going to be aged under 18 at the start of your course, we must have your parent or legal guardian’s written consent, giving permission for you to travel and live independently in the UK. We will send a parental consent form to you along with your offer letter. This must be signed and dated by your parent or legal guardian. You’ll also receive our information sheet for applicants under 18, explaining the University’s admissions processes and required guardian arrangements. If your parent or legal guardian is not resident in the UK, they must appoint a UK Guardian for you. This should be an adult the University can contact in case of an emergency. Please note, students enrolled on a programme with us cannot be appointed as the legal guardian of a young person under 18 applying to study at the University. For applicants who are under 18, the University also carries out a risk assessment before making an offer. If you have no contacts in the UK there are a number of agencies who can make guardianship arrangements. The Association of Educational Guardians for International Students (AEGIS) provides accreditation to guardianship organisations in the UK.